The Imperial War Museum Duxford has consistently proved to be both a popular and successful venue for H&H and has further benefitted from their innovative decision to send a catalogue to everyone registered on their mailing list, resulting in a packed saleroom and active internet and telephone bidding for the fifty eight motorcycles that were to go under the hammer. 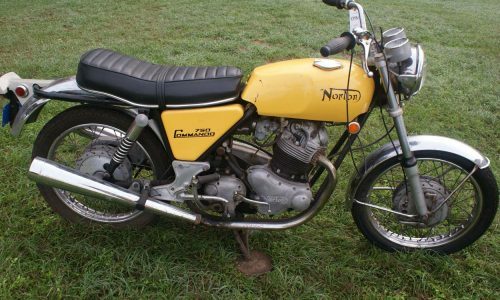 Early notable successes in the sale that included £19,040 for a delightfully original, Pioneer certificated 1913 Rudge Multi single with wicker sidecar and £21,480, from a German buyer, for a lovely 1948 Norton International 500 were quickly followed by H&H once again demonstrating their skill at achieving the highest possible price for a motorcycle when the hammer fell on the first Vincent Black Lightning to be built by the Stevenage concern. The machine, which had been discovered in Argentina by a member of the Vincent Owners Club and restored following its repatriation in 1991, was the subject of intense bidding culminating in its sale for a world record figure for the model of £246,000. A one owner collection of nine Triumphs had attracted a great deal of interest before the sale with all the machines finding new owners under Simon Hope’s gavel, the highlight of the collection being a lovely 1955 Triumph Tiger 110 fitted with period panniers and accessories at £6,496. 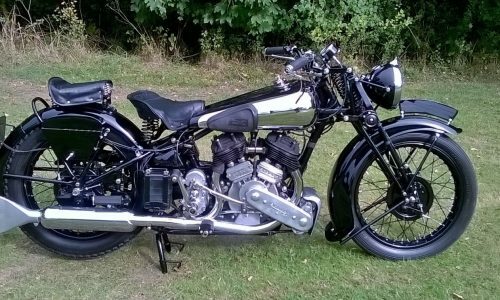 Proving that lightning can indeed strike twice the Brough Superior BS4, which had benefitted from considerable pre-sale publicity, sold for another world record price for a model, securing, after an intense bidding war, £246,400. 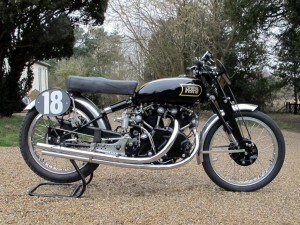 The record for the four cylinder machine, one of only seven surviving examples, brings H&H’s tally of record prices for the marque to three holding as they do already the record for an SS100 and an SS80 at auction together with the outright world record for a motorcycle auction with “Old Bill”, George Brough’s personal sprint machine, at £291,200. H&H will return to Duxford on the 16th October 2013.